It is this poem that is considered to be the passage of Blok into Soviet literature, which, when the poet was still, did not really exist. Unfortunately, the poet himself left this world due to illness, but his work remained with the Russian people. In fact, the poet was the last romantic of the Silver Age of Russian poetry. His poems are distinguished by a special style and syllable. Yes, and what other people could write poems with such a personified soul. 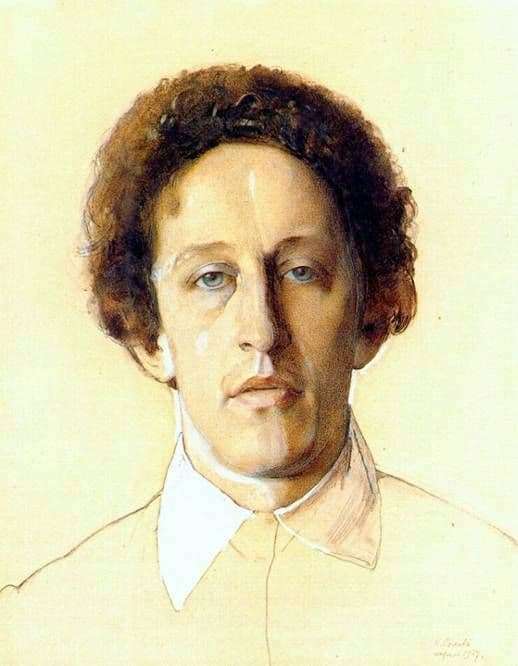 A wide and high forehead, a large chin, sad-blue eyes on a little roll-out of gray-blue color, barely penetrating mustaches and curly hair – this is the look of a Russian genius. He perceived the revolution as an inevitable and badly needed phenomenon, but still managed to understand for himself that everything was not so simple. Many critics are still sure: to remain alive Blok would have been waiting for him the fate of the same Yesenin – death disguised as suicide. Such as Blok and his associates were needed by the new authorities for the time being. And the poet shortly before his death realized this. Look at his face again. It is surprisingly calm, but at the same time there is some element of fatigue in his eyes. And then if you look closely, his face is a little sloping to the left, and curly hair covers rather big ears. The artist tried as close as possible to the original to give us the image of this amazing person. And he is amazing because during the time of famine he managed to write clear poems about time, about the city, about the change of moods. He wrote only two plays and about several hundred poems, but this is enough to say about his genius.